Our 24 Hours of LeMons "Porschelump" was far too much of a basket case for one crew member and an injured me to put back together in time to race it last weekend. So, we decided to hang out with some dudes who were trying to build two Austin Americas in the paddock. Bloody Brit and I, against all better judgement, have chosen to undertake the Rebuilding of Americas, not to be confused with the Short-Circuiting of the Americas (which will happen entirely of it's own volition some time after nightfall when Lucas strikes). Yes, inspired by the latest in LeMons propaganda wear, we have not only Bought a Hooptie, but we also intend to Race That Mofo. In fact, we have bought four such Hoopties, and we intend to do whatever we can to them in 36-48 hours so that we can Race those Mofos. Nick @ HQ has demonstrated he has no qualms about taking our entry money for what is obviously a futile effort to get 1 or more cars on track, so our late entry has been accepted. Now, we need Brothers and Sisters in arms! Brave Souls whose tetanus shots are up to date! People who like us are Mere Commoners but TOGETHER can become a Force! We need Welders and Wrench-weilders, Cooks and Crew, Drivers and Dollars! The plans are still unfolding and if you have Ideas and Resources to support them, it's not too late for you to join the United America Wrenchers, MSR Houston Local 1275 and share them. Lugnut and rhorad1 from Swamp Thang fame have already sworn their commitment to the cause, won't you join them?! 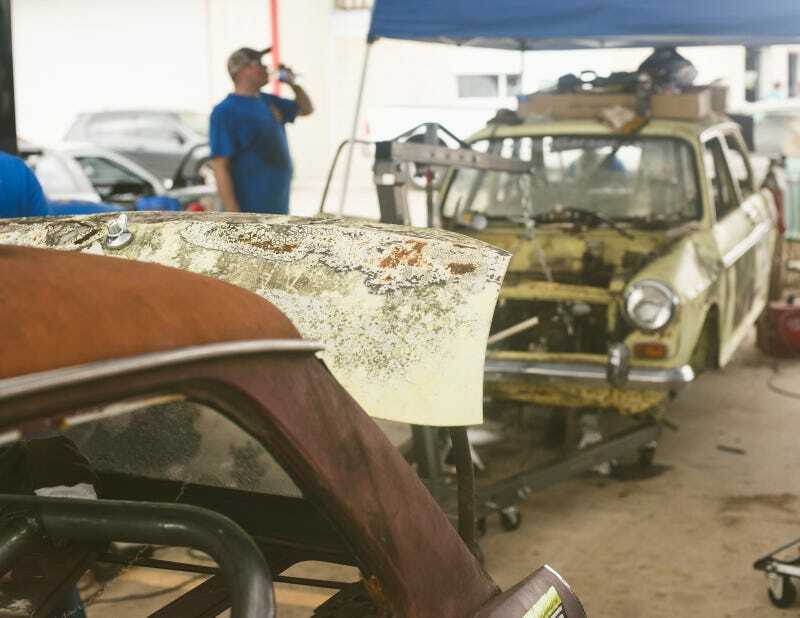 Not-so-fine print: (***) Once the cars are at MSR Houston some time Thursday Sept 26, we will commence with stripping them and installing pre-bent rollcages, new braking systems, race seats and resurrecting the power plants. Ideally we will work in teams focusing on specific areas of the cars to economize the effort to prepare 2 cars for taking the green flag at 3pm on Saturday. We also would like a well-rested "Safety Steward/Pit Nanny" or three to remind us to get adequate rest and food. Ideal Charter Members would be those who aren't already committed to racing with another team at MSR Houston for this event. A 24 Hour event with your #1 team is tough enough. We won't decline help, we just don't want to take needed resources away from any existing teams. *** I'll let BloodyBrit chime in about what he has planned for procuring the 4 cars over Sept 14-15th and possibly stripping down and disposing of one or more to alleviate space limitations. If you have a trailer, he certainly could use your help! You do realize that every single one of your worst nightmares are going to come together over this LeMons weekend, right? Disorganized tools, messy pit space, unprepared cars, maniacal wrenching, yelling at one another... It's all right there in the script. I think Spank was a little hard on himself when it came to organization, though. They seemed to put things in more organized piles than the ones in my apartment. Plus, most of the tools were color-coded with paint so that everyone could keep up with which tools went in which box. This is what is great about doing a 24 Hours of LeMons race: most of the paddock wanted this genuinely terrible idea to work. People from many different teams kept coming over to watch, offer help and offer words of encouragement to the Austin team. Unfortunately, once we started digging into these cars, we discovered that there were really only enough working parts for one car. In the interest of not having too many (unskilled, in my case) cooks in the kitchen, most of the Porschelump team-with-no-car dispersed to various places around the paddock and occasionally checked in to see what was needed. Then trouble struck...sort of. The exhaust fell off on the way out of tech. After a quick fix, the car was ready to go back out and run until the checkered flag dropped at 3 p.m. So, congrats, Spank, Brit & Co.—I can't wait to see this thing at another race. For something built in a weekend, it seemed oddly reliable once the exhaust was reinstalled. Hopefully that means an Index of Effluency win isn't too hard to get in the future.